The Best Tattoo Transfer Paper: Get your Stencilling Right! Nothing helps make a cleaner and more detailed tattoo than using some good transfer paper. Since freehanding tattoo designs can take more time and possible errors, getting a transfer sheet means fewer design flaws and shaky lines in your tattoo design. In this article, we will go over what ​exactly tattoo transfer paper is, the different types available, what to look when buying transfer stencil paper, and review the best transfer paper for tattoos on the market to buy. What are Tattoo Transfer Papers and Why are They Important? 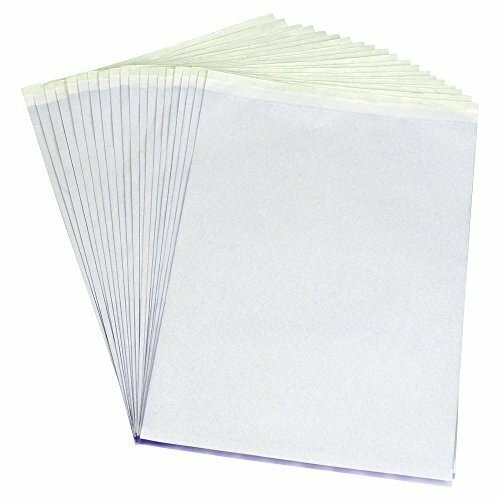 This type of transfer paper is the most standard to buy. While being incredibly inexpensive, it offers a durable print that does not come off easily while tattooing. While being a well-recognized product in the tattoo community, most tattoo artists opt for a more expensive brand while this will cover all the bases needed to give off a clean and detailed tattoo. 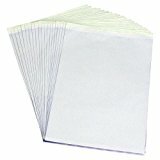 This tattoo transfer paper comes in a pack of 15 meaning you have plenty to last. The transfer sheets are an A4 size which makes it easy to print any design onto them by a thermal copier as well as being durable enough to write on easily. Pirate Face Tattoo is also a well-recognized brand that offers excellent prices on their transfer paper sheets. These carbon tracing stencil paper transfer sheets make for the perfect tattoo. They make freehand drawing simpler than ever and are shaped at an A4 size for easy thermal printing. The greaseless properties of the paper provide a much bolder look than any other transfer paper. 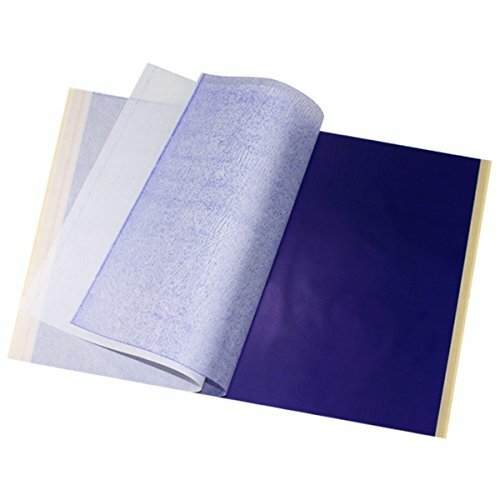 Never worry about designs fading while you’re working since these transfer papers are laced with a unique colorfast ink for long lasting durability. This tattoo transfer paper is modified to provide better support ​for thermal printing. Since it comes in a pack of 100 for such a low price, it is perfect paper to carry in a tattoo parlor. This transfer paper might not be made ​from the most durable material, but for smaller and less detailed designs, it is a perfect fit. The H88 carbon transfer papers are a particularly new design in the tattoo community. While they offer great flexibility for freehand designs, they are also perfect for thermal printing. They come in an A4 design which can fit many printers making it very versatile. Not to mention, it also comes in a 25 pack for plenty of different tattoo jobs. Tattoo transfer paper is a common tool used by tattoo artists when working. 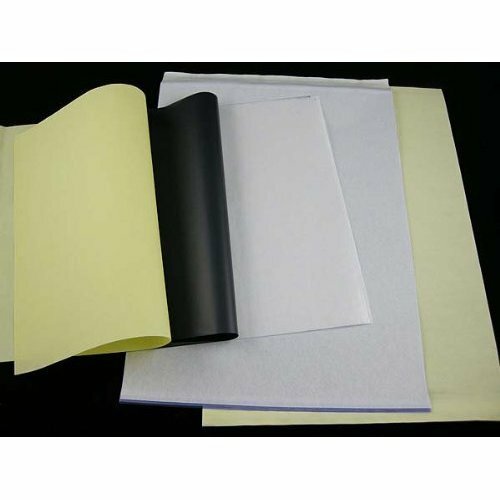 This paper is used to help transfer the customer’s artwork from their minds onto their skin. The artist listens to what the client wants their tattoo to look like. Then, they draw out the design on tattoo transfer paper. Because of this special paper and with the aid of a stencil lubricant, the ink from the design can then be transferred onto the skin of the client. Doing this gives the artist a stencil that they can trace over with the tattoo ink. This makes it much easier to do the tattoo, give the client what they want, and makes sure it looks good when it’s done. There is tattoo transfer paper that allows you, the artist, to freehand draw or trace by hand but there is also some that allow you to copy a pre-made design with the use of a tattoo thermal copier. This tattoo paper is activated by heat, which allows it to function with the special copier. This paper is relatively simple to use and will be found in almost every tattoo parlor across the globe. Tattoo transfer paper is instrumental in providing a much more detailed and clean look to any tattoo. When you freehand a tattoo, there can be noticeably shaky lines, and mistakes in the design can lead to a potentially frustrated client. This helps reduce work stress and makes your work look much more professional. Not to mention, a more trustworthy tattoo artist. There are two main types of tattoo transfer papers: thermal and hectograph. Both of these types of transfer paper perform the same function and have many similarities, but they also have a few significant differences. It is important to realize their differences as these two types of papers are compositionally and chemically different from each other. Thermal paper is designed to be used with an all-in-one thermal copier. This paper consists of four thinner sheets of paper. The first, top layer is white. This is the layer the design will be transferred onto. The second layer is a milky white color. 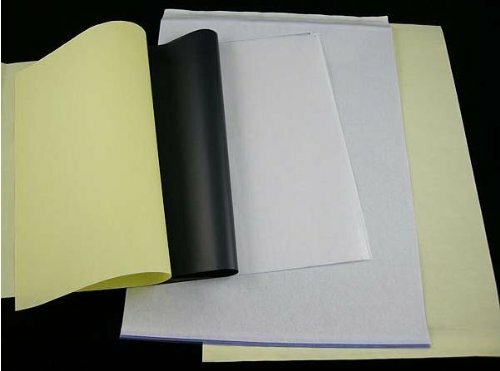 It is a protective layer that is not connected to the other papers and is usually thrown out. The third layer is generally blue or purple. This is the Carbon layer. When in the printer, this layer is pressed against the top sheet of paper. Then, the blue/purple coating is then transferred onto that paper in the shape of the design. The bottom sheet is yellow. This sheet holds the original design in place while in the copier. Hectograph paper is designed to be used when creating stencils by hand or when using a dot-matrix printer. This paper is comprised of three thinner layers of paper. The center paper is just a protective layer; you can throw this away. To use hectograph paper, it is easiest to freehand draw your design on regular white paper first. Then, place the hectograph paper on a hard surface with the white side of the paper facing upwards. Put your drawing on top of the transfer paper and begin tracing over it, either with a pencil or pen. When you are done tracing, your design will be on the back of the white piece of paper. 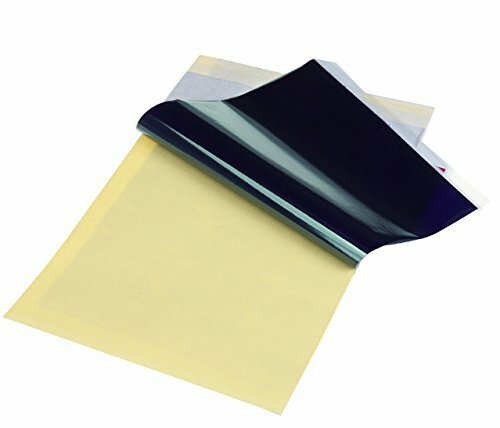 Follow us through the reviews to find the best tattoo transfer paper to buy! When it comes to applying transfer paper or freehanding a particular design, you may run into many difficult situations for yourself or your client. I compiled a list of the top 5 tattoo transfer tips to help you overcome any situation you may find yourself in. 1. Trace the tattoo first. You always want to tattoo to be first traced onto the transfer paper and double check with the person receiving the tattoo to make sure it matches their expectations. The tattoo design should always be traced with a medium-point pen by pressing down with enough force. (You don’t want it too light or for the pen to go through the paper) Once it is traced, cut around the design, giving about 1 inch around altogether. 2. Always wash and shave before tattooing. I don’t just mean your hands. You always want to make sure you wash your client’s skin where the transfer paper is going. You never want the pen’s ink to rub against their skin since it can cause irritation and mess with the tattoo design. Next, shave your client’s skin where the tattoo is going since hair carries a massive amount of bacteria. You don’t want bacteria brushing against your tattoo needle or your own skin. 3. Make sure the transfer paper is accurately placed. You don’t want to make any mistakes on this one. When you place the paper on the client’s skin, always want to make sure they like where it is placed. Once you wet the paper, always wait at least 30 seconds longer than recommended, since everyone’s skin is different it may take longer or shorter time to stick. If there are wet spots after you peel off the transfer paper lightly dab with a paper towel. 4. Repeat if anything looks wrong. The last thing you want is to have a messy tattoo ruining your tattoo career. If anything looks smudged or off, just simply redo the stencil and try again. It’s worth more in the long run to have a thorough design than to have something that looks bad and rushed. ​Well, there you have it inkers, our reviews and buying guide should hopefully help you decide which transfer or stencil paper you should buy for your tattoo inking. Just bear in mind the different types of papers there is and consider carefully the type of style or design you're looking to trace. With that being said, all the selections on our list above are there for a good reason and are of fantastic quality. Now it's your turn to choose and start transferring!